Which of the SQL statements below will retrieve persons of the same name from an “Employee” table? Which statement correctly describes the atomicity in ACID characteristics of a transaction? b) Once a transaction is completed normally, the updated results are not lost even if a failure has occurred. c) A transaction must end with its process having been completely performed or with its process having not been performed at all. d) The result of multiple transactions executed concurrently is the same as when they are executed serially. Which of the following is a correct statement concerning digital signature used for e-mails? a) Digital signature cannot prevent an alteration of e-mail contents, but it can detect an alteration. b) Digital signature can prevent an alteration of e-mail contents, but does not guarantee the confidentiality. c) Digital signature guarantees the confidentiality of e-mail contents, but cannot prevent an alteration. d) Digital signature guarantees the confidentiality of e-mail contents, and restores altered e-mail contents as well. Which of the following is a correct statement concerning maintaining integrity as a factor in information security for a payroll system? a) A system operator changes the system configuration to reduce the processing time of the payroll system. b) Pay statements are printed without fail by payday. c) Unauthorized employees cannot rewrite salary data. Which of the following is the decimal fractional number corresponding to a hexadecimal number containing fraction 3A.5C? The results of arithmetic operations on numerical value A, which has 6 significant digits, and numerical value B, which has two significant digits, were rounded off. Which of the following is correct as an evaluation of the significant digits in the calculation results? a) When A+B is performed, the result has six significant digits. b) When A-B is performed, the result has six significant digits. c) When A×B is performed, the result has two significant digits. d) When A÷B is performed, the result has three significant digits. How many multiplications are performed when the formula Y = X5＋aX4＋bX3＋cX2＋dX＋e is changed so as to minimize the number of calculations? At a certain factory, the same products are manufactured on two independent lines A and B. Line A manufactures 60% of all the products, and line B manufactures 40%. Of the products manufactured on line A, 2% are defective, and of the products manufactured on line B, 1% are defective. When a single product manufactured at this factory was selected randomly, it turned out that this product was defective. What is the probability (percentage) that this product was manufactured on line A?
? In this example, denotes a logical product (AND); denotes a logical sum (OR); denotes a negative AND (NAND); and denotes a negative logical sum (NOR). Which of the following results is obtained when seven integers 13, 17, 15,8, 3, 10 and 20 are inserted in this sequence in an empty binary search tree, after which two integers 8 and 3 are removed in this sequence from this binary search tree? 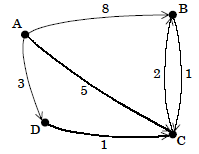 In the graph below, the shortest distance from point A to each point is determined using the Dijkstra method. Which of the following represents the order in which the distances from point A to points B, C, and D are determined? In this example, the numbers denote the respective distances. Which of the following is the best representation of the trend obtained by a graph expression of the relationship between the number of pieces of data and sorting time for sorting according to the selection method? multiplicands are expressed as 16 bits without signs. X, Y and Z are 32-bit registers, and logical shifting is used for shifting. Which of the following is the business process most suitable for study using game theory? a) Determining the number of entry gates at an event arena. b) Analysis of factors related to hot-selling products. c) Establishment of a sales strategy in a region where there are competitors. d) Demand projection and establishment of a profit plan for a newly developed product. Which of the following is a multiprocessor processing mode used by many of today’s commercial super-parallel computers, in which instructions that vary from processor to processor are executed in parallel? Which of the following is suitable as a description of the microprogramming control method? a) It is used on many RISC processors. b) Functions can be added and changed just by making microprogram changes, so it is easy to add and change instructions. c) Like ordinary programs, microprograms are stored in main memory, and read and used by processors. d) Machine instruction processing is faster than in the case of the wired logic method. Which of the following is suitable as a description of interrupts? a) When a CPU receives an interrupt, it interrupts the program being executed and stores information required for resuming the program in a specific area on the hard disk. b) Application programs must always detect occurrences of interrupts. c) A notification of the completion of an operation from an input/output device is classified as an internal interrupt. d) The causes of individual interrupts are given priorities for allowing occurrences of multiple interrupts. In a personal computer operating with a 200 MHz clock frequency, if the cache access time is 10 nanoseconds, the main memory access time is 70 nanoseconds, and the cache hit rate is 90%, what is the average number of clock cycles required for memory access? Which of the following is suitable as a description of the characteristics of MO? a) Data is recorded by irradiating laser light on a recording medium covered with a magnetized recording film, thereby heating it and simultaneously changing the direction of magnetization. b) Data is recorded on a thin plastic disk with a magnetic coating simply by changing the magnetization polarity. c) Data is recorded by a combination of extremely small depressed areas called pits, and flat regions called lands which are between the pits. d) Data is recorded using phase changes of a recording film being crystallized and uncrystallized by irradiating a laser light. Which of the following is a standard bus specification for personal computers, in which the address bus width is 32 bits and the data bus width is 32/64 bits? In a virtual storage system using the paging method, sometimes the frequency of page replacements increases and the system’s processing capability declines abruptly. What is this type of phenomenon called? In a virtual storage system in which the real memory space usable by a program is 3 pages, if a program with a size of 6 pages is executed, how many times will page faults occur? In this example, the page reading sequence during program execution is 0, 1, 2, 3, 4, 0, 2, 4, 3, 1, 4, 5. The paging method is LRU (Least Recently Used), and in the initial state, none of the pages has been read into the real memory. 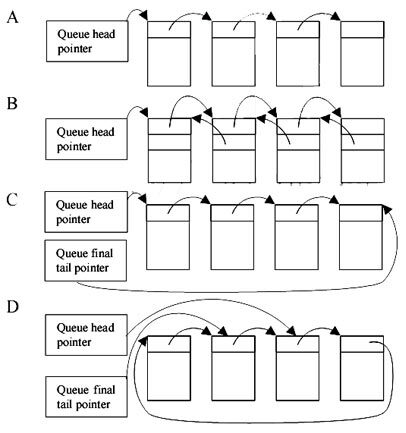 When a program was partitioned into tasks, multiple tasks entered into wait status under the same condition. At this time, which of the following inter-task synchronous control methods can simultaneously eliminate, from another task, all of the wait states of the tasks in which the condition occurred? Which of the following is suitable as a description of the round-robin (RR) task scheduling method? a) CPU resources are allocated at fixed time intervals in accordance with priorities of the individual tasks. b) At fixed time intervals, a timer interrupt occurs, causing a forced transfer of control to the first task in the executable queue. c) This method is suitable for real-time systems in which tasks must be started immediately when an interrupt event occurs. d) This method is not suitable for operating systems designed for multiple users. When a task enters executing status, ready status, or wait status, which of the following is suitable as a change in statuses when a task in executing status has its execution interrupted by another task due to preemption, up to the time that it again enters executing status? When storage areas are dynamically allocated and released repeatedly, sometimes storage areas which cannot be accessed from anywhere occur. Which of the following is a process that makes such storage areas usable again? In a two-layer client/server system that uses a relational database, which of the following sends an SQL message when a stored procedure is not used? Which of the following is suitable as a description of a duplex system? a) A duplex system consists of two computer systems. Normally, one of these systems is used as an online system, while the other is used as a standby system for batch processing, development work, and the like. b) A duplex system has higher reliability than a dual system, but is expensive. c) A duplex system has redundant hardware, and the same data is processed in parallel by two processing systems, the results of which are collated at fixed time intervals. d) In a duplex system, two CPUs share main memory and external storage devices, and operate on a single OS. Processes are handled in parallel by each CPU, and the load is controlled so that it can be distributed. Two branches, each of which has one automatic teller machine, are to be integrated. One automatic teller machine is to be installed at the integrated branch. Which of the following formulas determines the average waiting time for the automatic teller machine after integration? In this example, the waiting time is based on the M/M/1 queuing model, and the average waiting time does not include the service time. (3) The number of users after the integration is the total number of users of the two branches before the integration. The measurement results shown below were obtained when a certain SQL statement was processed. Based on the results, it seems there is some waiting for resources. What is the total waiting time in seconds? In this example, communication/processing time can be ignored. Which of the following is suitable as a description of the problems and solutions for improving the performance of a system that uses relational databases? a) When an SQL statement was executed, a full search occurred along the access path to which an index could not be used. Therefore, the database was re-organized. b) I/O waiting time increased due to concentrated accesses, so the database was partitioned into multiple disks. c) It was found that accessing was concentrated only to certain specific rows. Therefore, the index was re-set. d) The amount of data placed in an overflow area increased due to updates and additions during operation over an extended time period. Therefore, the block size was reduced. What is the operation rate of a parallel system consisting of the two devices shown in the diagram below? In this example, if one of the devices is operating, then the system is considered as operating. On both devices A and B, the MTBF (mean time between failures) is 576 hours, and the MTTR (mean time to recovery) is 24 hours.